Most of your leads won’t buy from you. I know, it’s harsh, but this is the truth. There will always be leads that won’t be ready to buy or won’t be a good fit for your solution. That’s why it’s important to qualify them and automatically increase your chances in generating more sales. There are a lot of tools that can help you in qualifying, some popular ones are BANT methodology, ANUM and CHAMP. However, we uncovered that our version of the methodologies above works best for us in qualifying our leads. Before digging into our model of sales qualification please keep in mind that the conversation during the call should be a natural one and not an interrogatory. It’s important to discover as much info as possible from the other person, listen to him/her and ask the right questions that build one on each other. Usually, people who use these methodologies consider them as a to-do list and forget to focus on bringing the real value they can provide for the person interested in their services/product. They are transforming the conversation into an interrogatory and this is a safe path to failure in sales. As for our methodology, we created a canvas to help us and you in qualifying the leads. We think that focusing on your clients' needs and providing the best solution for them should be the first step in the qualification process. But what does this mean? Well, you need to understand what is their current situation, what their problem is, what are the implications of their problems and at the end of this stage you need to really be able to identify their need/make them tell you that and make them realize how your product/services can help them. This is called the SPIN Selling methodology and if it’s used in the right way it can really help you qualify your prospects and to close more deals. Why did you accept to have this call?/Why did you write back to me? Can you tell me more about your current situation? How does your process for [insert problems that your product/services solve here] look like? What are your problems on [the niche of your product/services]? How do these things affect other people in the company? Why did you reach out to us? What’s your current status regarding [the problem that my product/service solves]? Did you use something similar before? What was your experience with it? The sky's the limit here. Your main purpose is to have a clear picture of your clients' current situation and their needs. That’s why you need to ask yourself what info do you need from them and how can you formulate/ask the question in order to find out that missing piece. In the modern sales, the authority process has changed a little bit. Today there are around 7 people involved in the decision making process. But how can you identify who else is involved in the decision-making process? Is there anyone else in your team that we should present our product to? What does he/she do in your company? Are you the only founder? These are only some example questions. You need to follow the same principle as above and also test your own questions. This stage is important for you especially when it comes to revenue forecasting and more. By knowing the timeline of your client you can estimate how long the sales cycle might take and get an idea about when there will be a chance of working together. Do you have a timeline for this in mind? Do you have a due date until you need our product? Can you tell me how does a buying cycle look like in your company? Are there any other departments involved when it comes to buying our product/services? Whether or not the person that you are talking to gives you some specific dates when they are ready to start using your product or buying your services, you also need to take a buffer time. The cases when things happen accordingly are rare. Especially when there is more than 1 person involved in the buying decision. All sort of reasons may appear which are not necessarily related to your client. With the SaaS industry reaching a huge boom these days, people are used to buying a lot of digital products for them and their businesses. With all that, you still need to know if your solution fits your client’s budget and if he/she is willing to pay for the value that you create. But how can you find that out? Well, in our case what works the best is using the anchoring principle. If your client is asking about pricing you can throw in a random number based on the previous experiences or double the cost of your solution and listen to the client reaction/ask for feedback ("Does this fit into your budget?"). Make assumptions: I assume that you haven’t bought a similar solution in the past. Ask something like that: Is there a budget we need to fit in? If things don’t seem to click in the bigger picture then it means that something isn’t right with the prospect and there may appear some red flags when you will start working together. Of course, you also need to have metrics and keep them as simple as possible. But enough talking and let’s do an example. We will make the same assumption like in the past articles. That you are the founder of a meeting appointments software and you want to increase the number of users for your platform. You have an upcoming call with a huge gig and they were interested in the custom enterprise package from your options. You want to qualify them and learn as much as you can in order to obtain the best deal for both of you. And how can you do that? Can you give me a little bit of background, please? How big is your sales team, how many appointments do they have per week? What are the problems they are currently facing? What impact do these problems have on your company? Did you buy something similar in the past? By asking these questions you will find out what’s their current situation, why do they need your solution and why are they interested in the enterprise package. They are beginning to understand the value that you can provide to them and you can actually show that in the next stage of the funnel when you will actually have a demo. 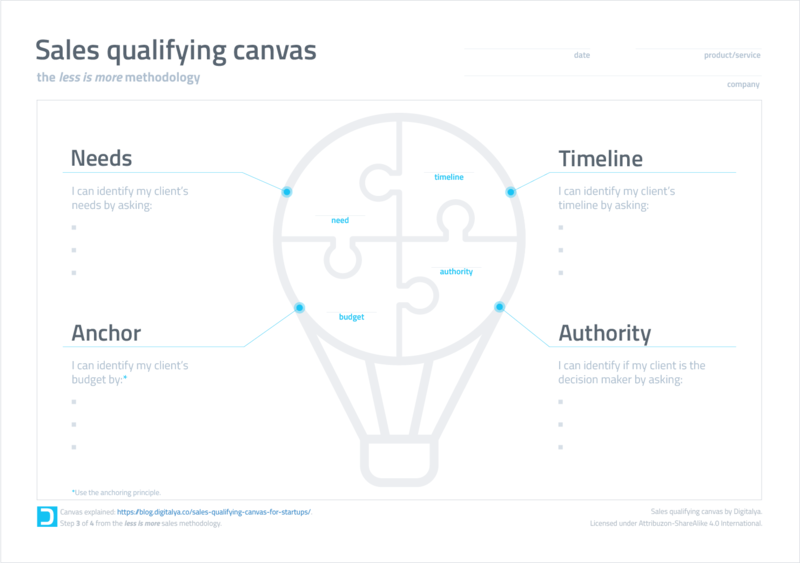 You’ve now identified their needs and raised awareness about the benefits of using your product, so it’s time to cover the next stage of the canvas, the Authority. Who else will be participating in the Demo? Are there any other people that will use our product beside you and the team? Are there any reports that you need to present to somebody else? At this point, you have a clear picture of the features that you should focus on the demo and to whom you will be presenting for. You will also have an idea about who has the go/no-go decision and who will use your product. All you need to know now is the Timeline and the Budget. How urgent is it for you to use a product like this? Do you know how much time it takes to sign the contract? What other departments will be involved in the buying process? It’s your first enterprise deal, so you don’t have any background on pricing for this kind of a deal. But you know that you want to close the deal at $50/month per user. So when they will ask about pricing you will use the anchoring principle and you will say that at a first sight it will be about $100 per user and you will discuss more that after you will have the complete information. Now you know what questions to ask in order to find out the info that you need and you are ready to go. Let’s say that you had the call and you find out that your prospect is losing a lot of deals because of the huge amount of time that his team is spending in scheduling a call to back and forth emails and he is in need of a solution that can help him to easily schedule those meetings. He also needs to consult with his sales team about the software the will be going to use and they won’t want to spend more than $70 per user. As for the timeline, they want to fix this problem ASAP, but it still takes 2 weeks to inform the legal department and sign the contract. All you have to do now is to transcript this data into the canvas, as you can see below. Before finishing the article please remember the thing mentioned at the beginning of the article. This needs to be a 2-way conversation, not an interrogatory. What this means is that, for example, at some point of the conversation you are talking about needs and the person on the other side tells you something about some similar product bought in the past. This is a perfect opportunity to find out more info about their budget. You can skip the Authority and Timeline for the moment and ask what product did he/she bought, what was the package bought (You can find out out that by discretely making an assumption like “I assume you bought the premium package due to team collaboration feature”) and any other questions that bound together and give you relevant info. But asking questions sometimes also comes with a flaw. We are getting caught in the showing off about how great we are and sometimes we forget about the other person. Then at the end of the call, we realize that we haven’t learned anything about our possible client and that we lost him/her. You can tell that a call went well when you did 80% listening and only 20% speaking. But I’m convinced that you won’t fall out into this trap and you will do great at qualifying. On an ending note, thank you for having the patience to read this article till the end. You can download the canvas example over here and in case you need help with that, feel free to reach out.